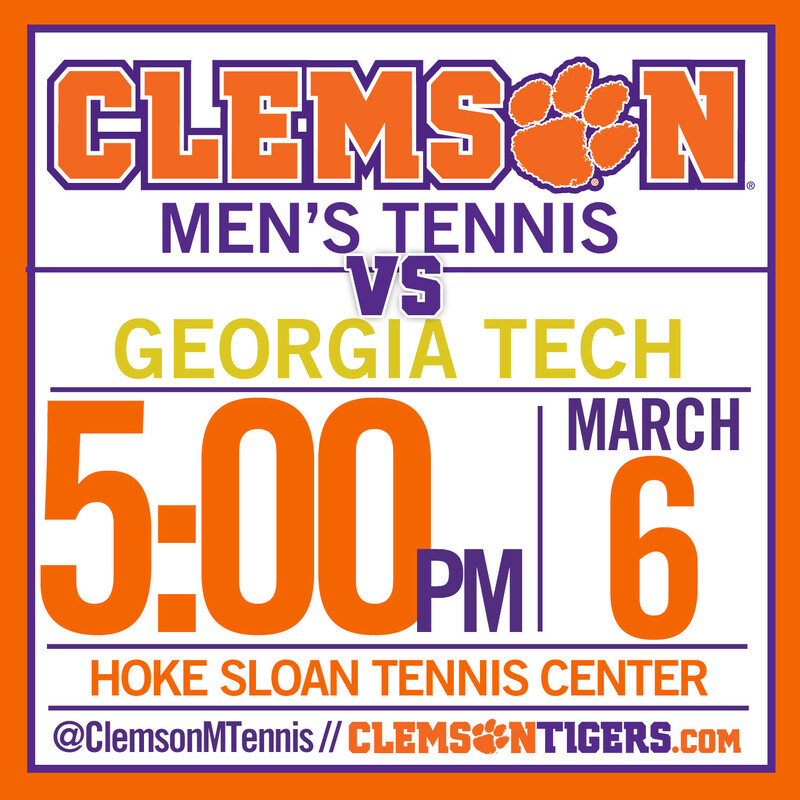 CLEMSON, S.C. – The 52nd-ranked Clemson men’s tennis hosts Georgia Tech Friday night at 5 p.m in the Tigers’ ACC opener. Live scoring will be available on ClemsonTigers.com and updates will be posted to @ClemsonMTennis on Twitter throughout the match. Pizza will be provided to the first 100 fans in attendance. Clemson is 7-5 on the season and coming off of a third place finish in the Blue Gray Classic two weeks ago in Montgomery, Ala. The Tigers defeated Alabama and rallied past Texas Tech in thrilling fashion in the three day tournament. After falling down 0-3 against the Red Raiders, the Tigers stormed back to win four consecutive points and the match. Sophomore Daffra Sanon won his match at No. 5 singles to tie the match at three, then Clemson won the doubles point to secure the win. Senior captain Hunter Harrington is ranked 109th nationally in singles by the ITA. The Yellow Jackets are 7-3 on the season and won their last two matches, 6-1 over Stetson and 7-0 over Tennessee Tech last weekend. The doubles duo of Carlos Benito and Eduardo Segura are ranked 51st nationally by the ITA, while Christopher Eubanks is ranked as the 57th-best singles player nationally. Clemson leads Georgia Tech in the overall series, 29-25. The Tigers last met the Yellow Jackets in Atlanta last season, a 5-2 Clemson win. Clemson is 13-10 at home all-time against Georgia Tech.